The memories of the suave moves and Hip Hop Rhythms of the very successful Heavy D & the Boyz will always take center stage in our minds when we think of jamming with a large thunder of electricity. 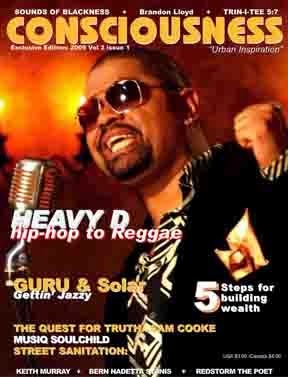 Over the last ten years, the Hip Hop world has moved on into many directions, but without the world of music having such pioneers as Heavy D around exposing his hits, something would surely be missing. I decided to check in with the world reknown Dwight "Heavy D" Myers, to see what has been keeping him so busy over the years. During the interview with him, I found out that he has actually been very active, as most multi-talented artist are. Lee Harris: Please tell us a little about the man we all have come to love and know as the "Overweight Lover" Heavy D.
Heavy D: Not so overweight anymore. It’s weird for me to talk about myself that way. I mean, I could say I’m the sexiest thing on two feet! LH: Hey look out now! I notice that, sometimes things change. You’ve probably answered this question many times before, but for Consciousness, who came up with the name Heavy D? HD: Absolutely, my older brother, who was a year older than me. Actually when we were younger, it was him, his older friends and I who had the two turntables. They kind of introduced me into the Hip Hop World. They would never let me rap on the microphones, because I was the little annoying brother. So, one of his best friends name was Heavy C. He was actually a good family friend; his name was Clarence Johnson. Through my search, I was trying to find my rap name, my MC name. 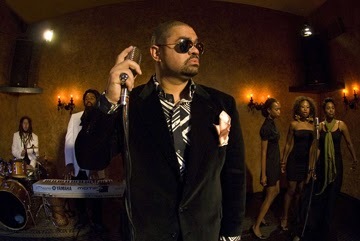 My brother just came in and said, "Just call yourself Heavy D." I said, "Yeah! I’m stealing that." I took it from Heavy C and I became Heavy D.
LH: After becoming Heavy D, did the thought ever cross your mind that one day if you weren’t so heavy, what you would do? Would you hold onto the name or what? HD: Well, the name and the beauty about the name is that it’s just a cool name. I’m not as heavy as I used to be, but it’s still just a cool name. It works out either way. It’s a brand and you don’t want to move away from it. LH: Just like Lil’ Romeo. HD: That’s right! As I get older and more mature, I incorporate my birth name, which my parents gave to me. Slowly but surely people will know both of them. LH: It is my understanding that you were born in Jamaica and came to the U.S. at a relatively young age. Are you actually of a Jamaican descent or were you just born there? HD: My whole family’s Jamaican. My daughter is first generation American. All my nieces and nephews are first generation Americans. LH: What triggered your interest in music and what was it about Hip Hop that interests you most? HD: Well… coming from Jamaica, which is actually the birth place of Hip Hop; believe me. If you’re familiar with DJ Cool Herc, he was the one that introduced the concept of the two turntables and the microphone, which had been going on in Jamaica for quite some time. I remember those vibes. It was a natural gravitation to me. The better question is, How could I have not been doing it? You can’t seek something like that out. It finds you, it’s either in you and it discovers you, because you really can’t discover it…I believe that. It’s like, there’s no way I can’t do this. I can’t imagine not doing it. That’s just me as an artist…period. The older I get the more I get involved as being an artist who encompasses not just music and acting; I might pick up a paint brush one day and discover I’m great at painting. I love the idea of being creative. To me, that’s what an artist is, just being creative. The world doesn’t have to really like it, but I have this desire in me that is always looking to create. LH: So in other words, you could basically say it was a purpose, because you’re very good at what you do and you love it? HD: That’s the better word. [I’m not a fool]. I recognize my status and I hate saying, I’m great at it. If I’m great or if you perceive me to be great, it’s only because I love it. I have a tremendous amount of passion for it. LH: Well based on your stage performance and everything that I’ve seen over the years, you do love it. I can see it all over you. HD: I’ll tell you something. The reason it took so long for me to make another piece of music is because I didn’t love it anymore. I had outgrown what I was doing in my life at that time. I had records sitting in a vault that one day, maybe would get released somehow. I wasn’t satisfied with the quality of it. Through the process, I discovered that it’s over. I fell out of love with it. I felt that I had conquered this to the best of my ability. Not that I was the best in the game at it. I had given it my best. I had come to a point where I should probably not do this again, because all it’s going to do is diminish what I’ve done and dishonor the culture. I put the culture first. It’s a challenge to be good. When growing up looking at the cats that were older than me, I had to be that good at least to do it. I was only trying to be better. When I was cutting over the last ten years trying to assemble a Hip Hop album, I realized it was over. I put that exclamation point on it! I’ve always had one foot in Reggae and one foot in Hip Hop. I’ve done records with Super Cat, Buju Banton, Coco Tea, Josie Wales and all the legendary artist. I’ve always wanted to do a Reggae Album. Being in a big system, they didn’t see the benefit of it. For me it would have been for the passion, fun, art and doing something I love. So, it was commerce verses art, as usual. If you’re not in control of your own label, commerce will win because they write the checks. Now I’m in a situation where it’s my label. I can do what I want and I’m doing what I want. It’s probably one of the most gratifying experiences since probably my first two or three albums. LH: This takes me back to Sam Cooke. I spoke with his nephew a while ago and he has this book out called, "Our Uncle Sam, the Sam Cooke Story." It talks about owning your own label and being able to have the rights and say so to everything you do because it’s your work, it’s your creation. HD: As it should be, yes! You hear all these horror stories from cats who were making records sixty years ago and it still happens. I was a victim of it basically, because I signed my first record deal in ‘85’ or ‘86’, so the practices haven’t changed that much since. Now, a lot of new guys come from the streets with their street mentality of ownership, which works wonderfully. They legalized themselves and made an empire. It’s interesting because you don’t have to sell a whole lot of records to make a whole lot of money when you own your own stuff. LH: I’m learning that the industry, like you say, is all about the industry. It’s not about the artist, so the artist has to get smarter. HD: The industry…it’s dissipating as we speak. More and more artist are coming in with not just regular record deals. They’re coming in with wanting ownership as they should. You know, with the internet, you see a lot of these companies folding. The creativity diminished alot. Things have to get worse, like drug addicts. They have to hit rock bottom before they can pick themselves back up. My perspective is…the creativity needs to be challenged and the bar needs to be raised. LH: I know you’ve probably been over this many times, but I would like to ask. In July of 1990, the tragic death of your friend, Troy Dixon during a stage performance shocked and pained not only the Hip Hop World, but even millions that only knew him as a part of the group. What do you say to someone else when trying to find the peace and strength to move on from such hurting times? HD: Well, I don’t talk about that much. I’ve lost two brothers of my own, tragically. What I’ve realized is that you have to accept that it is what it is. There’s a certain level of carelessness that goes along with you continuing to live life while you’re dealing with death. There’s nothing you can do to change the circumstances. You can’t kill yourself and join those people, whether you think so or not. What you have to realize is that you’re still alive. If you have kids, you have to be alive not only physically but spiritually. You can’t let it damage your spirit. I have to smile for my daughter everyday. I have to laugh with her, and she knows when I’m not in a good mood. She’s only eight and she’ll look at me like, "What is your problem!" And I’m like, "Ok! Let me switch up. Sorry!" Kids that age, they’ll think it’s them. I made a choice to look at my mother and her strength and Troy’s Mother and her strength. They still laugh and they still have a good life. Death is inevitable. There’s nothing you can do about it. With that being said, what you can’t conquer, why waste time! LH: Heavy D & the Boyz became the first group signed to Uptown Records, which signed several powerful acts such as, yourself & the Boyz, Christopher Williams, Jodeci and Mary J. Blige. What was it about Heavy D that lifted him to the top position as President and CEO of Uptown Records? HD: Oh Lee! What it was…Andre Harrell and I had a wonderful chemistry. I learned a lot from Andre and he is just a genius; the Barry Gordy of that generation really. I mean, he really had a vision and fought for the vision all the way through. Look at the artist you named; Jodeci, Mary, myself and Puff, even though, I brought Puff to Uptown. Andre groomed Puff. Alot of that credit goes to Andre Harrell and just to my own vision of where I see myself. For the most important thing is that Andre taught me that if Heavy D liked it, then it’s a Heavy D thing. It’s a Heavy D record. A Heavy D movie or play. He said, "if you like it, it’s something you should do." He made me realize that I fit into a unique category of you don’t quite know where to place me. Only I really know, because, if I pitch you an idea, you go, "Hey whatever! If I do it and deliver, you go, "Oh, I get it!" This was a motto that I learned from him early on and I stuck with it. Sometimes they’re hard battles, because it’s really just you against a million people. Everybody’s saying no and you’re the only one saying yes .So you’re going, I’m not that smart, come on, somebody else have to see this. LH: But that’s what they saw in you. HD: Right! So that’s what makes me different. Then I started looking at not comparing myself now, but looking at people like Prince, Stevie Wonder, like…the What’s Going on album and Barry Gordy forbidding Marvin Gaye not to do that album. HD: Oh yeah! I don’t know if you know that story or not. LH: No, I did not know that. HD: Yeah! Barry said it himself. There’s a wonderful documentary…it was on where he talks about this album will not sell. And sure enough…shocked the world. If you’re an artist, it’s your responsibility to be true to yourself first. The minute you start listening and following people, it’s the death of an artist; not physically, but the death of the artist within the artist. It’s very important that you don’t make art to please people. It’s weird to say that, because that’s what we do eventually. That’s what’s been happening. It’s your thought and vision that people are responding to, not what the round table suggests. Art should never be by committee. Here’s what I have. Honestly, if you go back into time and all your greatest artist from Prince to whomever. If you look at it, go back into time. You will see that there was probably one person, one person that believed in a Ray Charles, a Stevie Wonder, a Marvin Gaye…one person. That one person had the power to convince hundreds of others to get behind the product. I remember when I was doing Soul for Real’s album. I don’t know if you remember them. LH: Yes, I do as a matter of fact. HD: There was a record called Candy Rain. And a great friend of mine who used to work at Uptown Records, Lewis Tucker, was like the radio promotions guy and he didn’t understand the record. We were friends first and he was a guy that I kind of looked up to and admired. He was like, "I don’t know man, I don’t think we should put this record out." Something in me was like, "Dude, just trust me," and he left it alone. I don’t know if it was the passion I said it with or whatever. He left it alone and he trusted me; that record blew up, sky rocketed. He didn’t understand. Later on, Doug Morris who I idolize as well, I idolize my dad, but who I have a tremendous amount of respect, love and honor for, told me, "No matter what you do, you pick the record and then you give it to the people promoting radio. Just because they promote radio doesn’t mean they know how to pick records. Don’t let them tell you what to pick! Give them the record and you make them work the record." LH: Now you wrote that yourself. I mean, you actually produced it? HD: Oh yeah! That song was written by myself, Terry Robertson and Track Masters. The whole album was a wonderful collaboration. LH: Looking back on your music, (Albums) Living Large, Big Tyme, Peaceful Journey, Blue Funk and Nuttin’ But Love, all hit from 1 to 10 on the R&B Charts, placing you with three platinum and one gold albums out of five. In 1997 and 1999, Heavy D, popped the top ten again with Waterbed Hev. Not excluding the great ratings on the pop charts. With that came 22 singles. How did you guys handle all the immediate success?